In September, the US Department of Agriculture greenlighted new GMO corn and soybean products engineered to resist two kinds of herbicides, Roundup (glyphosate) and an older, more toxic one called 2,4-D (which was one of two ingredients in the powerful defoliant used in the Vietnam War called Agent Orange). And on Wednesday, the Environmental Protection Agency approved of a new 2,4-D formulation called Enlist, which has been designed for use on the novel seeds, in six corn/soy-heavy states: Illinois, Indiana, Iowa, Ohio, South Dakota, and Wisconsin. That means starting in spring 2015, farmers in the Midwestern Corn Belt will likely be dousing their crops with 2,4-D as well as Roundup, in an effort to control the plague of weeds that have evolved to resist Roundup. 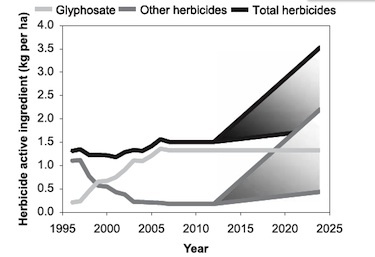 The authors predict that glyphosate (Roundup) use will hold steady at high levels—and use of other herbicides, like 2,4-D, will soar. : From Mortensen, at al, “Navigating a Critical Juncture for Sustainable Weed Management,” BioScience, Jan. 2012So what’s the big deal? In this 2012 post, I laid out research by a team led by Pennsylvania State University crop scientist David A. Mortensen (paper abstract here) on how the new products are at best a temporary solution to the problem of “superweeds”—they lead farmers down a path of ever-increasing reliance on agrichemicals. They argue that chances are “actually quite high” that Dow’s new product will unleash a new generation of weeds resistant to both herbicides, because when farmers apply 2,4-D to weeds that are already resistant to Roundup, they’ll essentially be selecting for weeds that can resist both. Their projection of how such double resistance will affect herbicide use is at the left—a boon for agrichemical sales, but not so great for the environment.